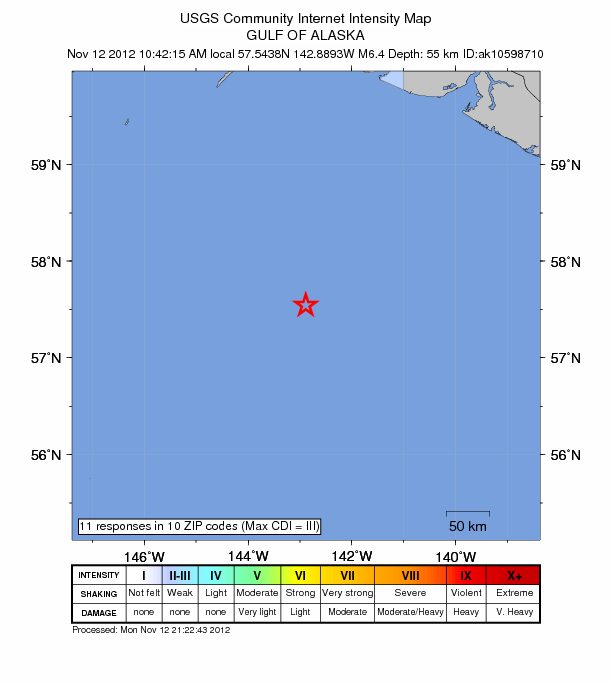 Strong earthquake with recorded magnitude 6.4 struck Gulf of Alaska on November 12, 2012 at 20:42 UTC according to USGS. Epicenter was located 289 km (180 miles) SW (221°) from Yakutat, AK and 370 km (230 miles) SSE (153°) from Cordova, AK at coordinates 57.544°N, 142.889°W. Recorded depth was 55.2 km (34.3 miles). EMSC also reported magnitude 6.4 but depth of only 2 km. The curvature of the arc results in a westward transition of relative plate motion from trench-normal (i.e., compressional) in the east to trench-parallel (i.e., translational) in the west, accompanied by westward variations in seismic activity, volcanism, and overriding plate composition. The Aleutian arc is generally divided into three regions: the western, central, and eastern Aleutians. Relative to a fixed North America plate, the Pacific plate is moving northwest at a rate that increases from roughly 60 mm/yr at the arc's eastern edge to 76 mm/yr near its western terminus. The eastern Aleutian arc extends from the Alaskan Peninsula in the east to the Fox Islands in the west. Motion along this section of the arc is characterized by arc-perpendicular convergence and Pacific plate subduction beneath thick continental lithosphere. This region exhibits intense volcanic activity and has a history of megathrust earthquakes... read more on Aleutian Arc here.